Chicago attracts a sizeable share of tourists interested in the city’s rich musical history — a melange of blues, jazz, rock, soul, house and gospel. Besides the chance to hear live music by world-renowned musicians seven days a week, there’s also the record collector treasures that fill the city. Chicago has long been a crate digger’s paradise, with DJs and vinyl fans scouring local record stores. 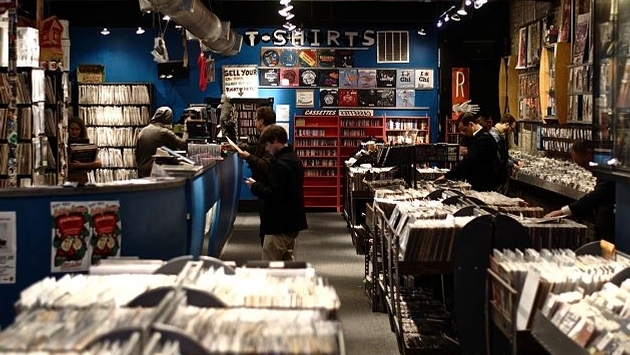 Despite the focus on digital music, old school record shops are enjoying resurgence. You’ll find shops that offer everything from pop, soul, blues and rock classics to specialty stores focusing on rockabilly and house. Most neighborhoods boast their own vinyl meccas (most also sell CDs and tapes); here are some of the best record stores to visit across the city. With a chain of stores spread along the north side, Reckless Records is the city’s most visible and commercially successful record shop. It's also a landmark that started in 1989 as a cool little shop with great prices that has expanded into practically an empire. The Wicker Park/Bucktown location (newer, and bigger, digs at 1379 N. Milwaukee Avenue) stocks the biggest and most diverse selection but the Lakeview store offers more jazz and the Loop shop is a little bit of everything. This is the shop to visit for quick browsing. The biggest and newest record store blew into Chicago in February 2015, settling into a neighborhood of vinyl riches — Wicker Park. First opening in Minneapolis, Shuga Records boasts 2,000 square feet with 20,000 records on the retail floor, not to mention the online inventory (search the digital database via iPad) and hundreds of rare, vintage posters. A mix of new, classic and used records makes up the collection. Go here if you have lots of time and you’re searching for specific albums. Named for the vintage record players and turntables that fill this quirky emporium, you can also scoop up good picks for vinyl to actually play on the machines. Audio Archeology sells new and used LPs and the selection is pretty sizable. Celebrating the "vinyl lifestyle," this Roger Park shop also sells home accessories, record player equipment and vintage furniture. It’s off the beaten path but worth it for the collectibles you won’t find anywhere else. A Wicker Park institution, this store is filled with endless genres and personality. Head to Dusty Groove if you're searching for pristine Tropicalia imports or a specific dancehall collections — the global vinyl selection is exceptional. The shop is also noted for amazing soul and funk finds. If you think Chicago record stores begin and end in Wicker Park, think again. Hyde Park Records supplies such a carefully curated collection of rare treasures that European DJs and crate diggers regularly make pilgrimages. This Hyde Park shop is also noted for house records and popular DJ nights. I’d recommend a stop here for serious music fans and house heads. Literally packed with stacks of vintage records, Out of The Past Records is a Garfield Park landmark. Specializing in classic soul, blues, jazz and obscure Chicago R&B, the store draws oldies fans from all over the world. The records aren't organized so be prepared to spend lots of time digging. Located in a neighborhood that’s not that accessible, this is the place for die-hard fans used to traveling to out of the way places and getting their hands dusty. The name says it all. This Bridgeport classic is as old school as it gets. Cassette tapes, LPs and faded KISS posters make you feel like you've stepped back in time at Let's Boogie Records & Tapes. The offering is very broad, with classic rock, pop, country and hip-hop being highlights. Forget about maxing out your credit card on stacks of 70s rock because it’s cash only so bring lots of dollars. This is another out of the way shop, make a visit if you’re up to exploring and into kitsch.